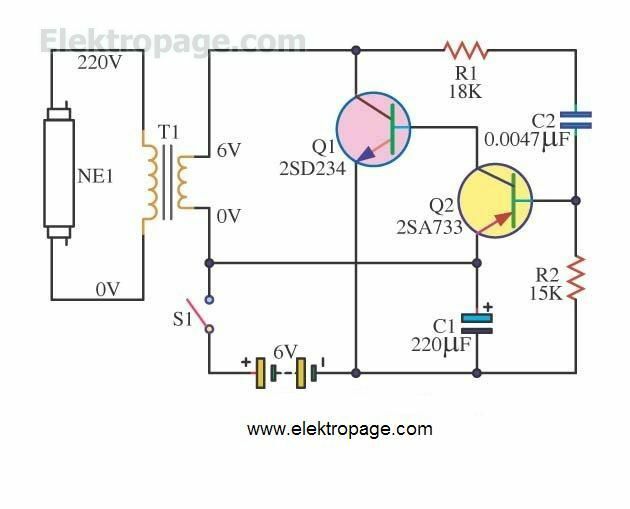 With this circuit and component is not so much to give us the light. Portable to get about easily to get to Fluorescent light of power supply be battery AA 1.5V x 4 pieces, Merely. Operation of the circuit be, When you click the switch S1 to the C2 charge fully via R1 and R2 while C1 will charge fully make the volt bias on Q2 the Q2 bias and the Q1 running by Q1 bias then it will have current flowing through the primary coil (6V-0V) of the transformer T1. While the Q1 bias, the voltage d r o p across the fall C2, Q2 will be stopped. The C2 will gradually discharge through R1 and R2. Completely Q2 will begin running again. This behavior, it will make the voltage of primary coil (6V-0V) of the transformer. T1 is the induced alternating current at the secondary coil voltage is afforded approximately 220V. It allows the fluorescent light.